If you are feeling generous this Christmas, we would love to receive gifts from you. As part of our 12 Days of Giving social media campaign, we have created an Amazon wishlist. As the cold weather approaches, the need for certain items such as Thermos flasks, sleeping bags, and clothes becomes pressing. That is why we have made it easy for the public to find all of the items we need this winter in one place. How Do I Donate? When you log-in to purchase from our Amazon wishlist, you can select ‘Simon Community Scotland’ as the delivery address option. We preloaded our address to make it as easy as possible for you to take part. 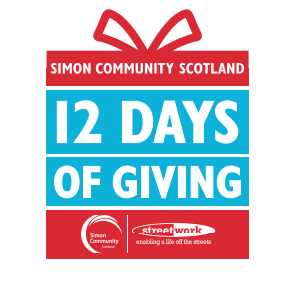 Just select ‘Simon Community Scotland’ and your gift will come directly to us*. Once we receive your gifts, we redistribute them to those affected by homelessness who are sleeping rough on the streets. *PLEASE REMEMBER TO SEND A NOTE AND CONTACT DETAILS WITH YOUR GIFT SO WE CAN THANK YOU. We’re expanding our team! We support people who often experience stigma and exclusion. The challenge we face is giving people hope. We want to make life a little better for the people we work with. Can you help? Read more about current vacancies and our volunteering opportunities on our’Join Us’ page. HAVING ENOUGH OFFICE SPACE IN THE RIGHT PLACE IN GLASGOW CITY CENTRE IS A CONSTANT CHALLENGE. To help people in crisis, we need to be quickly accessible and have somewhere private to meet with them and other agencies. If you have a building with space you’re not using in the centre of Glasgow that we could use for our teams to have as a base, please consider helping us so that we can respond to people in crisis. To find out more email or call us. MOST OF OUR SERVICES HAVE GARDENS AND WE WORK HARD TO MAINTAIN THESE. We would love if anyone is willing to help us keep them looking beautiful and a lovely place to relax in. Do you have some green fingers and strong backs to help us with the work. Would you be willing to help us maintain the gardens? To find out more, please email or call us. WE’RE LOOKING FOR DONATIONS OF GAMES CONSOLES AND CONSOLE GAMES THAT WE CAN USE IN OUR SERVICES. We will also be able to give these to service users moving into their own homes (e.g. xbox, Playstation and Wii). Any fun activity games would be great to organise within our services. If you have a new console you don’t need or an older one in good condition we’d make good use of it. We’d also welcome any games and controllers you have spare. To find out more please email or call us.